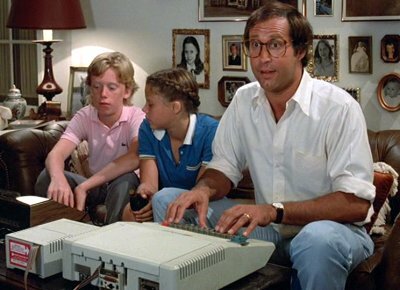 Clark uses the Apple II to show the kids the route he plans to take. There seem to be some extra keys stuck on to the Apple. 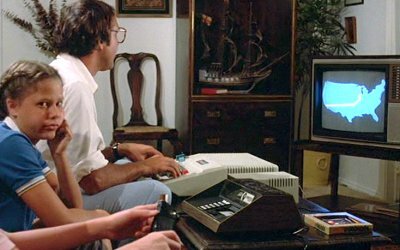 There's also the little detail of the Bally Astrocade sitting next to the Apple II being somehow able to interact with it without them being connected to each other in any way! Ditto on the Bally Astrocade, maybe it worked like a customer I had back in '79, who bought a printer and set it down next to his Apple II and then called to complain that it wasn't printing. Took a bit to finally realize he hadn't purchased an interface card, he thought proximity was sufficient. Looking at the back of the Apple II, it is sporting a Novation AppleCat II modem interface box, although no phone line is connected. With a plug-in transformer, the AppleCat could control X-10 devices. I used to program both the Bally Home Arcade and Apple II's with AppleCat modems. Extra keys added to vintage computers are common, you can usually find examples of user-added upgrades.